Question: What is This Blog, and Who The Hell Are You? But it also unexpectedly became a place where I chronicled personal experiences a) in the workforce and b) about the particulars of my own journey, and therefore, my life. About that journey. Along the way, I’ve read loads of books (and blogs, and message boards, and so on) about saving, investing, and personal finance. Some of what I read helped me to prepare in one way or another. And some of it didn’t. I wrote about the bits that didn’t seem to be covered by the usually light and generic stories in the books I’d read. Like how difficult it was for me to actually quit my high-paying job. Or the realization that I’ve always felt insecure about money because I grew up poor, and this insecurity fed into desires to continue to work even though I’d become financially and otherwise mentally ready to quit. Or just how strange it is, culturally, to leave a job that most other people appear to be jealous of. Especially at a young age. And how it feels to discuss early retirement with normal folk who unquestioningly believe they’re going to work their entire lives because dammit, what the hell else would you do with your time anyway, and for that matter, why would you want to save anything you make, since spending makes us all so HAPPY. There are some tricky paths to be navigated, for sure. 2) I’m an anonymous personal finance blogger. You can think of me as Living a FI, or LAF. I also write much of the content under the pen name Dr. Doom, not because I’m particularly doomish, but rather because it’s sort of fun to pretend I’m a diabolical supervillain and I’m a big geek so there you go. More details: I retired just prior to turning 38, after nearly sixteen years straight in the workforce. And what did I do, during those years? Some software development, some IT work, lots of paperwork, schmoozing, networking, liasing, and whatever else appeared to be required of me. In 1999, I got started in Silicon Valley, working for a startup in the heart of San Francisco. 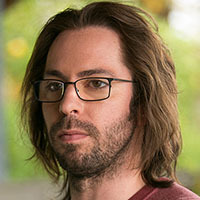 My friends tell me I most closely resemble Gilfoil from Silicon valley, both in appearance and personality. Not an idea man, exactly. More of an evil, cynical implementer. After four years, I moved back to the East Coast to join another company doing more or less the same thing. Then I went to another company. And another. Sometimes the work was great, and sometimes not-so-much. But no matter how I felt about the particulars of whatever job I held, there was one constant: It felt like I was always working, or thinking about work, or getting ready for work, or decompressing from work, or talking about work with my friends even when we were not at work. At any rate, I realized I needed an out, a sort of Plan B that I could resort to thinking about to perk me up after bad days. And I might not have come to this realization as I did but for the dot-com bust. When money grew tight in the Valley, employers began to treating employees like slaves instead of royalty, mostly because they could: Jobs were suddenly scarce. My workplace happiness correspondingly suffered. It was around this time that I learned that there was another option available to people in this position. You don’t have to work your entire life. You can instead work for a while — less than a decade if you’re smart, thrifty, and driven, and almost certainly not more than twice that even if you go about this business lazily — and then hang it up. The basic trick, to be repeated year after year as you grind through your career, is simple. You must a) save a large portion of pay and b) invest it to generate passive income. Of course, for the vast majority of people, saving a lot of money is going to require lifestyle changes, because people tend to spend everything they make. I considered the alternative by talking to people at work who were in their late thirties or mid forties or early fifties and had been working, decade after decade. Their attitudes toward work were various degrees of bored, resigned, cynical, apathetic and, sometimes, surprisingly, grateful. But a closer look at the gratitude revealed that this emotion nearly always related directly to feelings of stability and security, e.g. at least I have a paycheck or how else you gonna get health-care type thoughts, and so on. It became a massive fear of mine that I would become one of those people: Decades of life gone, sick of the work and the schedules, but dependent on the paycheck and benefits. Wishing I could do something else with my time on this planet, but being unable to actually pursue anything because of the number of hours you must spend engaged in work-related activities of one sort or another. I readily admit, the fear of becoming stuck in this sort of mostly unfulfilling and nearly all-encompassing lifestyle virtually forever was a tremendous motivator when it game to making the lifestyle changes necessary to enable early retirement. But there was another side to it as well. It wasn’t just that I wanted to run from work. I also felt like sitting in an office simply wasn’t the best use of my time on the planet. It’s unnatural, like so many of the things that we do in our modern lives. Humans weren’t built to sit in cubes all day. We’re made to distribute our energy in a wide variety of ways, each and every day: Socializing, spending time out of doors, hunting/gathering, dancing, creating music or other forms of art, loving, child-rearing, solving problems for our communities, and so on. I believe we are biologically unsuited to be as specialized as most of our jobs demand that we become. We crave variety and dynamism. Most office jobs do not provide either of these things in any sort of reliable volumes, and in fact, because of the massive time commitments, they actively take away from the possibility of a more well-rounded life. This results in professional dissatisfaction for most, at least over the long term. Knowing all of this, I dug in. I read the required materials on investing and saving and how to value my time and my money. I cut my living expenses, switched jobs a few times, and banked a ton of cash over those working years. In the meantime, I got married, bought a home, sold a home, and did my best to enjoy my life outside of work. Eventually, after a final year of mulling over the numbers (was I ready? Did I save enough? Was I confident that my plan would work?) and also coming to terms with the major lifestyle changes in store for me, I pulled the trigger and quit. There’s been no looking back. By the time I found those sites, it was the late aughts and I was already well along in my journey to Financial Independence. Although I find those (and all) saving and investing blogs to be inspiring in one way or another, they didn’t put me on this path, and they didn’t keep me there. But they sure did make the walk more pleasant. Everyone’s trip down this rabbit hole is a little different, and mine is no exception. This blog exists mostly because I thought it might be interesting and fun to put my own perspective out there. 1) I wound up documenting large swaths of my existence swimming through the high seas of the working world. There’s a great deal of indulgent personal content on these pages. 2) I found that I didn’t have much drive or interest in discussing the lower level nuts and bolts of personal finance, i.e. I didn’t want to teach Finance 101. Instead, the blog makes a basic assumption that you have the fundamentals down, that you are debt free (or close) and either already investing or ready to invest. Thing is, there are already an abundance of terrific blogs to help you if you’re in the very early stages of wanting to get out of debt, and you might be better served by simply reading Mr. Money Mustache and Early Retirement Extreme. I didn’t want to reinvent the wheel. 3) I am not as extreme as the guys who run either of those sites. It’s just a fact. Consider: My spend rate is about 24K/yr for me and only me. MMM’s spend rate is 24K/yr for his entire family. 4) I am also not an entrepreneur. Period. It’s never been a goal of mine to create my own business, or plug product, or recommend product, or improve my blog’s SEO scores by tagging and back-linking and meta-tagging and so I can place ads all over the place and turn this into a hustle. 5) I didn’t (and don’t) want my entire identity to be about financial independence and early retirement. Although it’s an interesting subject and a goal worth pursuing, it’s not something I can devote large numbers of hours to thinking about now that I’ve reached the endgame. Nowadays I’m much more interested in Other Things, e.g. spending time with the people in my life, pursuing other hobbies, etc. Honestly, I can’t imagine going to the effort of retiring early in order to make the rest of my life revolve around retiring early in the form of, say, constantly blogging and/or writing books and/or doing interviews and/or continuing to try to promote my website and/or running seminars and/or retreats and/or reviewing product and revising product recommendations and so on. That’s just not the life for me. I’m more of a well-rounded leisure guy. Note: You may wish to read an older copy of my About Me page, archived here. New to your blog. I love it so far. I also follow MMM, GoCurry Cracker, Jim Collins and MadFIientist; this is a nice complement to what they specialize in. Planning to quit between now and Dec 31,2015. I did hit my FI target last month (June 2015). So why the wait? I plan to use the next 6 months or so for serious planning (what next!) and add more to Safety Margin. Hoping to get laid off over the six months as that will give me a one-year severance package but I doubt this will happen given my above average IT Exec performance and how the company is doing. Am your new fan! I really like your writing, straight, to the point and no sugar coating. I worked in various IT office jobs for a total of 8 years before giving up. I now live in Asia teaching Computer Science for 20 hours a week. I have been doing it for 6 years now. It is better than being in an office but since it is not a high paying job I have scaled back my plans of early retirement by a few years. I am at around 550K with my portfolio of dividend paying stocks. I’ll need a few more years before leaving for good. But at the same time I cannot even think about returning to a 45-50 hour a week IT office job.